Hmph. 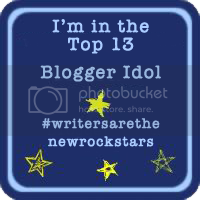 Maybe now they will believe me. 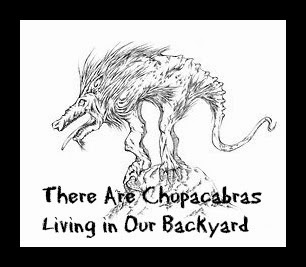 And by “they,” I mean, of course, “my husband.” My normally quite rational, logical husband, who refuses to look at the evidence and surmise, as I have, that there are chupacabras living in our backyard. 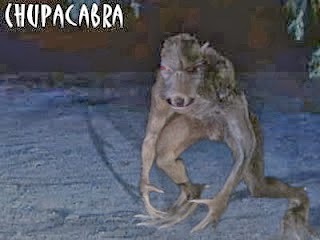 Or, if not chupacabraS, then at least *a* chupacabra. I first learned the monsters lived in our backyard about a year ago, which I wrote about here. Since my discovery, I’ve had to make some changes in my life. I have learned that if I only venture into the backyard during daylight hours, when the beasties are asleep or hiding, I can pretend that we live in a relatively safe urban environment (the helicopters hovering overhead notwithstanding). You know—it ain’t just a river in Egypt, and all that. But yesterday afternoon, my blissful bubble of denial was popped. I stepped out onto the sunny back stoop, heading to the garage to do laundry. And I immediately noticed that something weird had appeared in our backyard overnight. It was an almost-perfect circle of white and gray seagull feathers. And not just a few feathers. A WHOLE BIRD’S worth of feathers. In a one-foot-diameter circle in the middle of our backyard. I knew this was not good news. I knew that there was not some naked and embarrassed seagull shivering in a tree somewhere regretting the last night’s drunken avian adventures. And I knew that there must be more than just feathers in that circle, and that I was just too far away to see what. I was going to have to assess the damage and decide how to clean it up. So, imagine my surprise when I reached the circle of feathers and found…just feathers. No corpse. No skeleton. No guts. Nothing. Just feathers. Of course, you’re probably thinking of the more usual urban predators. I thought that too. I thought, despite the weird circle pattern and the lack of bones and such, that maybe a cat or a hawk had just chosen our backyard to feast. But then I remembered the bird feeder. Little did I know that I was actually putting their precious lives in danger by attracting a dangerous mythical creature to our backyard. Because, one day, the bird feeder fell out of the tree. At the time, I was pretty sure the a-hole squirrels chewed through the twine. Makes sense, right? My husband picked it up and put it on our back stoop, figuring we’d re-hang it the next day. But the next day? The next day, we found the bird feeder in the middle of the yard. Something had dragged it off the stoop and had feasted on the remaining birdseed. 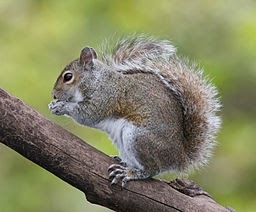 My poor, naïve husband blamed the squirrels again. I, on the other hand, wasn’t so sure. I mean, how strong ARE these squirrels? Are they working together? Have they evolved to the point where they have started to use tools? NOT the face of evil. Sorry. No. Of course not. 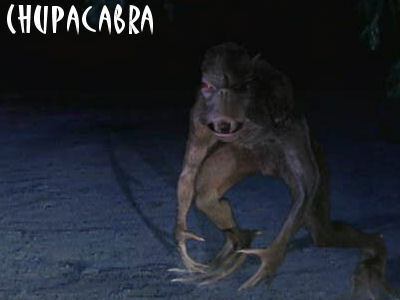 Clearly, the chupacabra was back. But, because I am a good wife I smiled and nodded at my delusional husband and placed the bird feeder on top of the water heater, whose top stands about 5 feet off the ground. I still thought I’d fill it up and re-hang it. Because the next day??? The next day, the birdfeeder was back in the middle of the yard. SOMETHING had climbed the smooth-sided aluminum box that houses our water heater, grabbed the birdfeeder, dragged it out to the yard, licked it clean and then—adding insult to injury—chewed a big hole in it, rendering it useless. I threw the dumb birdfeeder away, thinking optimistically that at least the chupacabra would leave us alone now that there was no food left in our backyard. Which brings us back to yesterday and the circle of feathers. And the fact that I am currently accepting any and all suggestions for chupacabra extermination. It's actually a predatory bird attacking another. Happened in our backyard and I looked it up. So a hawk, for example, attacks another bird. It pulls out its prey's tail feathers, pulls out its throat, and then dismembers it so it can carry it off to eat. Interestingly, a bunch of people post asking if it's witchcraft and wondering if a disgruntled neighbor has put some sort of black magic curse on them.